A modest machine for the classroom or small shop. It provides production efficiency for class or club projects and small commercial ventures. The T-shirt or jacket slips easily over the formica-covered particle board. 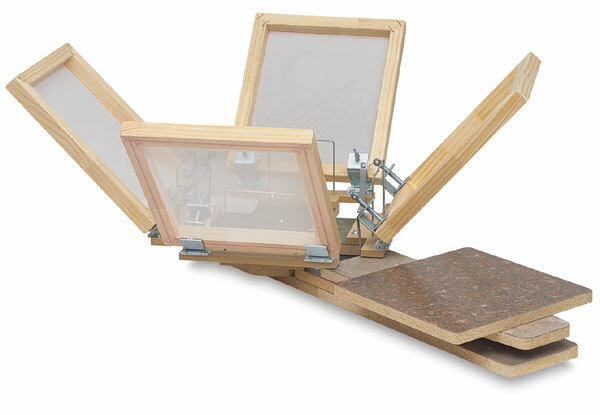 Two heavy-duty hinge clamps hold each screen frame securely. The frame automatically catches and stays in the "up" position until the operator releases it. This machine prints up to 4 colors on one shirt at a time. Screens and frames are not included. We recommend using 8XX multifilament polyester screens (12" × 18").